I'd like to avoid spoilers and deal in the general as this is a first episode "review" and answer the question; is the show worth watching? I believe the answer is absolutely yes. The setting is dark and gritty, the characters are recognizable and interesting enough, the music pairs with the tone and ambiance that the show is striving for perfectly, and the art style makes the show stand out in a season with plenty of pretty spectacles for the eyes to behold. 91 Days has the potential to be one of my personal favorite shows of the season and you would be doing yourself a disservice by not watching at least the first few episodes. TL:DR - You should watch this show (at least the first episode) if you are looking for good music, a unique setting, a mature tone, and an interesting plot revolving around characters with room to grow. The maturity, tone, and execution of the fast-driven plot has really peaked my interest for this anime. At the time of writing this review, I have watched up to episode six so far, and have been excitedly waiting for every new release of this episode. In fact, I have also re-watched all the previous episodes at least once to see any little foreshadowing of the plot that I may have missed the first time around. This is genuinely the kind of anime that I missed and yearned for the most. Adult-oriented, dark, with a rich plot. It seems that lately, there has been an over-abundance of animes that are slice-of-life, moe, and quite frankly, fan-service. If you want an enriching story that gets you to the edge of your seat for pretty much every episode, you need to see this. The amount of clever betrayals (and "false-betrayals") in just the first six episodes alone is astounding (you will not be disappointed in episodes 2 and 6 in particular). What binds me most to this anime is that, despite the fact we know beforehand that "this is a revenge story" (reminiscent to The Count of Monte Cristo), the execution of this revenge is still unexpected and makes this anime a rollercoaster of a ride. My only gripe about this anime would be the fact that the main character, Avilio/Angelo Lagusa, does not have much character, especially in contrast to Fango, a wildcard character who is crazy (actually crazy though? or madman theory? - referencing episode 5). However, I've seen other similar unemotional characters in plot-rich anime before, and the plot usually vastly compensates for this one gripe. Not to mention that his lack of character and emotions does make sense in context with what happened to him and his family in the anime (minor spoiler for episode 1). Unfortunately, I cannot continue more analysis of this anime without giving away major spoilers, but I could definitely talk more about the nice references they have to Christianity, the Bible, the Goliath, The Waste Land, The Godfather, et cetera - but alas, I cannot. I definitely hope though that by writing this review, you, as a reader, can become convinced that this is definitely one of *the* animes this season. I highly recommend people (who are of mature age) to it. So far so good. Japanese voice actors must have had a real hard time saying all those italian words, but for the most part they have the pronunciation down if you don't mind the thick accent of it. There aren't many good mafia anime out there, this one might fill in the gap. In past 10 years I can only recall 4 anime that have heavy mafia/organized crime themes. And of those 4 only Baccano did well enough. My only concern is that they leave the viewers behind. The plot tends to skip around a lot, and because the names are in italian it's a bit hard to follow who's who and which family has problems and which doesn't. If they can clear up that confusion within the next few epsiodes this could be great. 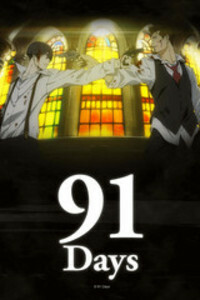 91 Days is one of those shows where the premise immediately grabs your attention, but leaves you cautiously hoping to yourself "They better not screw this up..."
Well fear not, because 91 Days delivers with a compelling story about crime, deception, and a quest for revenge in a chilling 1920s American Prohibition setting. Shuka may have went into this show with a limited budget, but they utilized what they had to work with and made a very well put together show. While held back in animation, Shuka was able to utilize strong cinematography, mise en scene, atmosphere, and music to hold everything together and deliver in the end. The story continued to up the ante and get even crazier each week. Towards the end I was repeatedly shouting "WHAT THE HELL?!" at my TV at every cliffhanger we were left with, and in the end we received a satisfying conclusion. 91 Days is just a damn good show. Plain and simple. Watch it. The first episode starts you off with a pretty good amount of backstory to go on and a bit of character development, which is always a good start. Also, the anime is pretty unique being set during the Prohibition era. And from episode 2 they already start stringing the episodes very nicely together and make it a pretty good adventure from the start by already developing some twists that made a lot of sense based on earlier actions of the characters and aren't really out of nowhere. The animation looks lovely and they took in consideration a tremendous amount of detail by including a lot of realism in how the mafia in the anime get things done. So, just from the start I can say I'm very excited to see how this plays out. This show is SO good. You literally can't take your eyes off the screen for even a moment, the storyline of this anime seems pretty good so far, and it's SO good that you have to see it for yourself to give your own opinion on it. Cause you either like this anime or you'll LOVE IT. I have no reference point for this show as I have avoided spoilers. But wowzer the first 10 mins of episode one are a gut puncher. The anime style is incredible and the voice acting is top notch. I'm definitely vested to see where this show goes!! Ok so from just seeing the first episode ive been instantly drawn in and can see that this show has amazing potential. The writing is on point and the execution of events is very well coordinated. Its all set up to drawn you in and get you invested in the story. It wants you to feel for the MC and try to understand his emotions. Its the classic revenge story but the way its being told is definitely interesting and worth a watch. I initially found out about this anime when it was about to be aired and was highly intrigued by it but decided to wait till it was completely finished because i know that most revenge style animes are the kind of animes that you want to finish in one sitting. I've watched a lot of these kinds of animes and many times the creators mess it up with the ending or making it too easy to figure out but this anime did not do that at all. I never felt tricked or betrayed by what happened in the anime and never had a moment when i was pissed off at the main character for doing something, And it didn't drag on or have a moment of awkward silence, it was very very smooth in that regards. Overall this is a great anime to watch and highly recommend it if youre into revenge styled things. It will not disappoint you. Story was seamless, and great theatrical feel. Highly recommend to anyone who wants a break from the more "commercial" productions. The story definitely used many inspirations from the Godfathers and drew extensive clues from Western mafia makes, but the essence of the characters and their decisions, twists, and expressions, are very typical of Seinen ("mature") genre anime -- and 91 Days has done a beautiful job. My recommendation is: despite that many would call "story / plot" a strength of 91 Days (the script writer is famous for great plots), don't over focus on plot or the depth of plot, which is due to be restricted by the format of a 12-episode TV animation (versus a real theatrical production). Instead enjoy the hues, the music, the voice acting, and the beautiful ending -- and the story is just great that it didn't ruin any of the art.